Just four short miles south of Virden sits the town of Girard, a village of about 2,200 people. One of the first settlers in the area was a Frenchman by the name of Girard, who built a sawmill on the banks of Mill Creek. By 1834 more pioneers were also living in the area, including W.T. Bristow, Daniel Black, Elisha Smith, Dr. Edwards and Colonel George Mather. With the settlers becoming more numerous, a stage line from Springfield to Alton, Illinois began to run through the area. Built along an old Indian Trail, this road would later become Illinois State Route 4 and Route 66. In 1834, Dr. Edwards and George Mather laid out a townsite and named it Girard after the Frenchman and his mill. However, their plat was never recorded and the “town” wouldn’t actually be established for more than two decades. About a mile and a half north of the present-day town of Girard, a man named John Henderson established a stage stop in 1835. He would later sell the stop to John Virden, for whom the town of Virden was named. By 1843, there were enough settlers in the area that a schoolhouse was built in the southwest corner of Girard Township and was taught by Elizabeth McCullough. In 1852, when the Chicago & Alton Railroad was built through the area, there was much more interest in establishing the town. In the spring of 1853, another townsite was laid out by Barnabas Boggess and Charles Fink, which encompassed much of the same land as the 1834 plat. Lots were then sold for $20 each. The first homes were located near the square, the first of which was brought in from the country by Barnabas Boggess. Another was built by Sam Boggess, which also served as the town’s first boarding house. J.S. Warfield built a new home and established a blacksmith shop. The first privately operated school was taught by Harriet Purdy. In 1854 several businesses were erected including Alfred Mayfield’s General Store and W.E. Eastman’s drug and merchandise store. J.W. Woodruff built a warehouse and shipped the first carload of wheat from Girard. Daniel Macknett established a lumberyard which he owned until 1893. It would operate for more than a century. The post office and the first hotel, called the Girard House, were also established in 1854. The town was incorporated on February 14, 1855. That same year, the first flour mill was built on Mill Creek by H. Hall and the first church was built. It was a shared building utilized by all denominations until each could build their own. A brickyard was established by William Lancaster in 1857. Operating until 1898, many of the buildings that still stand today were made by the brickyard. The first newspaper was started that same year – the Girard Enterprise. It was published until 1879 when the Girard Gazette also began. The Gazette still operates today. In 1858 a public school was built after the town had voted to support a property tax to meet its expenses. The wooden schoolhouse would serve all grades until in burned in 1870. 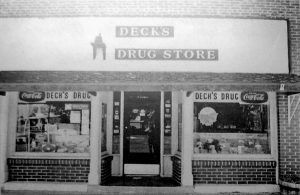 The oldest business in Girard is the Deck Drug Store. It was originally established by Dr. Clark in 1865, who had an office on the upper level. He was joined by Lewis Deck in 1884 who ran the pharmacy and later became the sole owner. Passing the business to his sons, the drug store was family operated until 2001. It was then sold and operated by new owners before closing down a couple of years later. This was the first time that Girard was completely without a pharmacy of its own. 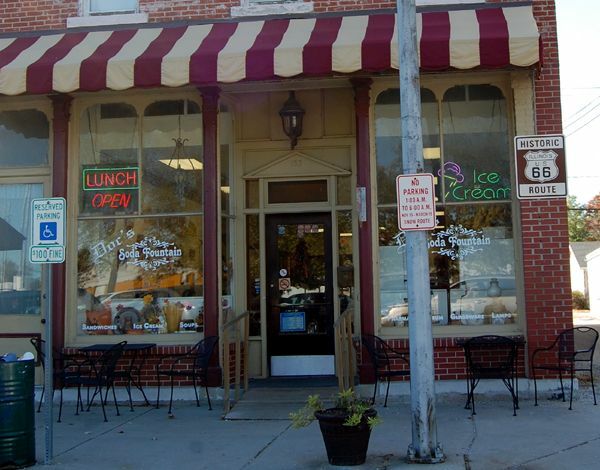 Today, the building operates as Doc’s Soda Fountain and Deck’s Pharmacy Museum. 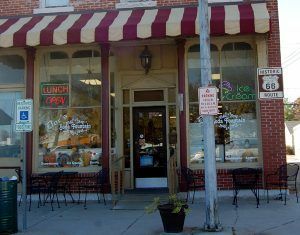 Still serving up great old-fashioned treats and filled with pharmacy memorabilia, it’s a great place to stop. Two years later, in 1867, Bowersox Clothing Store opened. Though changing ownership several times, it remained in business until 1976. That same year, F.W. Ring came to Girard and opened a bakery and restaurant. A well-educated and accomplished musician, he also organized and trained a band which became the best in all Central Illinois, traveling by train to every major celebration of any kind to furnish entertainment. Girard really began to grow when the Girard Coal Mine was sunk in 1869. Throughout the years, Girard would be called home to nine different mines, at their peak employing some 600 men. The Girard Coal Mine closed in 1922, dealing a terrific blow to the town. Only one mine is in operation today. The St. Nicholas Hotel was built on the south side of the square in 1870. A new two-story school was built the same year of red brick which contained eight rooms and seven teachers. The State Bank of Girard opened in 1873, which operated for decades. 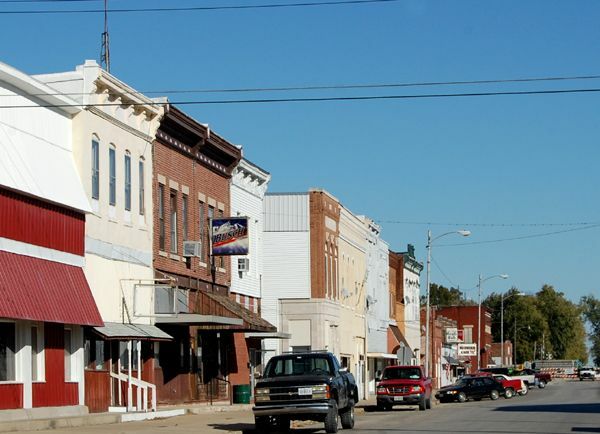 By 1870, Girard was called home to about 1,500 people, three steam flour mills, a butter and cheese factory, numerous merchandise stores, a lumber yard, two hotels, and five churches. The school served some 400 students. In 1879, a fire started in a coal mine shaft while all the men were down below. Extremely frightened for the friends and loved ones, the townsfolk rallied and every bit of salt in the city was dumped into the shaft, saving the men from certain death. A Lock Factory was established in 1880, that would operate for the next 40 years. Dodson’s Opera House was opened in 1893, serving as the cultural center for the town. Road shows, vaudeville companies, musical troupes, and home talent productions were held there regularly. Later it also showed first run movies. Continuing to thrive during its coal mining years its public square was lined with various businesses often not found in so small a town. Unfortunately, many of these first building, constructed of would have been destroyed through the years by fire. When they were rebuilt; however, they were constructed of brick. The last two frame buildings were destroyed by fire in March 1909. Later that year, in October, a larger fire took the businesses of ten men on the west side of the square, even though they were built of brick. The fire was thought to have been started by a burglar because the safe of Dr.Riffey’s drug store had been rifled. The next year, another fire took out several buildings on the northeast corner of the square, including the Girard House Hotel. The first cement highway to raise Illinois out of the mud stage was State Route 4, which passes all the way through Macoupin County from north to south. It was built through Girard and Virden Townships in 1921. Girard then began to work on its streets, first around the square, which was paved, and the other roads were oiled and rocked. 1922 was not a good year for Girard as the closing of the Girard Coal Mine dealt a large economic blow to the community. Making matters worse was a mining disaster which occurred in December. When gas ignited an explosion of an unused part of the mine, several men were riding through the tunnels to the bottom of the shaft. The men in the first car were terribly burned. One man would die from his wounds and 16 men were injured.